This marker is in the shape of an arrowhead and stands approximately seven feet tall. The surface is a patchwork of irregular stones held with masonry, and both the front and rear faces are inset with a metal tablet. The front tablet shows the bas-relief image of a Native American intended to represent “Chief Sequoia” (Sequoyah) of the Cherokee but shows an Indian wearing a feather headdress more indicative of plains Indians. The rear shows a small tablet with the image of a buffalo (bison). This buffalo sculpture is the older of two known styles. It was cast in the shape of the bison with the word TRAIL along the bottom. Later versions were square with the word ROAD across the bottom. The marker was moved twice in its history at the university, and was reconstructed most likely after the first move. A comparison of photographs throughout the history of the marker indicates that the stones on the monument are likely not the original stones used during construction in the 1930s. The metal plaques on both sides were painted at some point after the final move. This Boone Highway marker has been numbered 136 on other online databases. The numbering system was simply the order in which Everett G. Marshall identified markers while researching his book, Rich Man, Daniel Boone. Everett was not aware of this marker and his book ended with number 135. The marker was dedicated sometime around 1933. 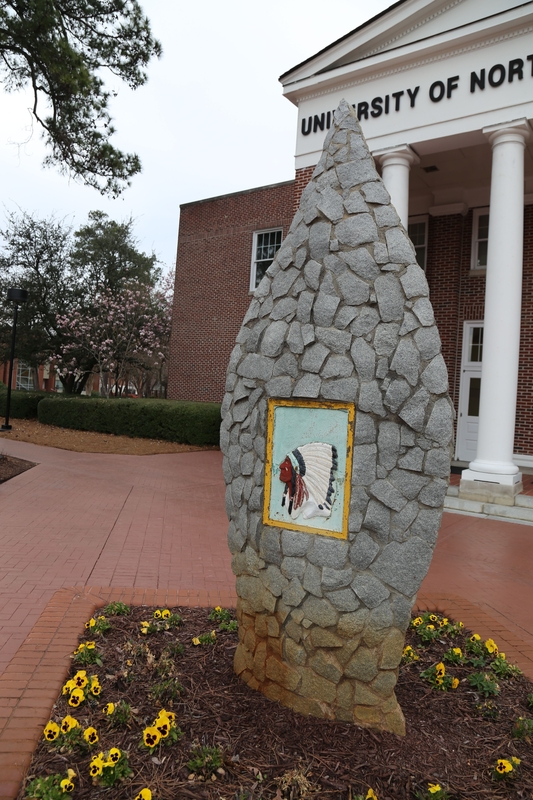 The marker at UNC-Pembroke also has the image of a bison on the rear face, possibly a reference to the idea that trade routes developed out of old bison paths and became the location of trade routes used by both white traders and Native Americans. 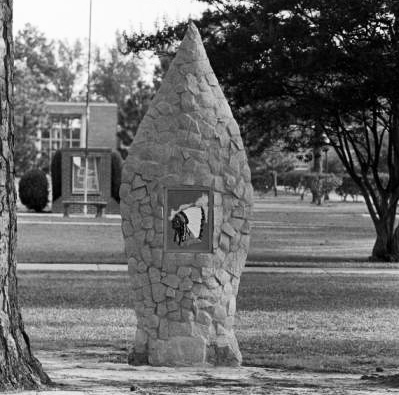 The use of the Indian head and the bison, without the plaque of Daniel Boone, may reflect the history of UNC-Pembroke with its beginnings in 1887 as the Croatan Normal School, created by the North Carolina General Assembly for the training of Native American Public School teachers. The state legislature changed the name in 1911 to the Indian Normal School of Robeson County and again in 1913 to the Cherokee Indian Normal School of Robeson County. In 1941, the name was again changed to Pembroke State College for Indians and then to Pembroke State College in 1949. The UNC-Pembroke yearbook is called The Indianhead. The monument is located directly in front of the Old Main building on Old Main Road (also known as West Railroad Street) in Pembroke. The marker sits in a rectangular lawn area in the brick walkway in front of the building and is several steps from the Statue of Hamilton McMillan. The Arrowhead Marker has been moved twice since it was erected. It was originally located on the Quad between Old Main and Sampson Hall.